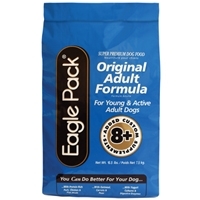 Eagle Original Adult Breeder Dog 50 lb. Feed the most digestible meat meal protein, from real meat sources. Our high digestibility makes it easier on your dog's system, so it remains healthy and functional for those adult years. 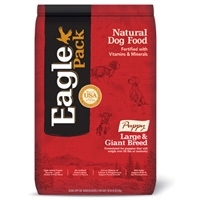 Eagle Large & Giant Breed Puppy 30 lb. Proven to help control the structural growth for that critical period from weaning to 18 months. (See Pet Health for more) Ours is the only brand test-fed on eight litters of Great Dane puppies (1990). 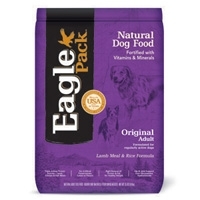 Eagle Natural Pack Dog 30 lb. No soy is used. Soy is known to cause digestive issues. Oatmeal, rice and corn are used as quality carbohydrates.